Confession time - we have eaten horribly lately. Nothing healthy has happened in the past few weeks. Life has been hectic and I have been lazy as a result. This week, though, I decided to be more intentional about the meals I made and food I bought. I bought good snacks (ie - no poptarts) and made sure that every meal I planned had a good amount of veggies in it! Here's to trying to get back on track during the month of crazy travel! This past Sunday, I did a meal experiment and it turned out really well, so I thought I'd share it. 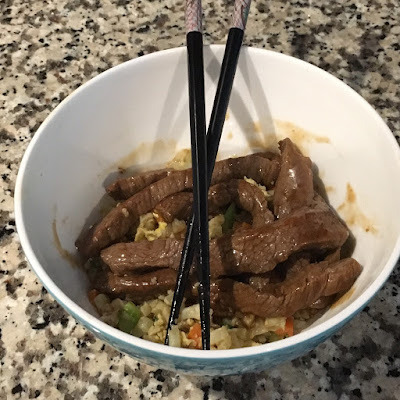 I combined my beef and broccoli recipe with a cauliflower fried rice recipe. First off - it took me a whole 20 minutes to make this meal. That's always a win in my book! And it was low carb and lots of veggies! I can't say that it was Whole 30, gluten free or Paleo, but it was pretty close. Here we go! 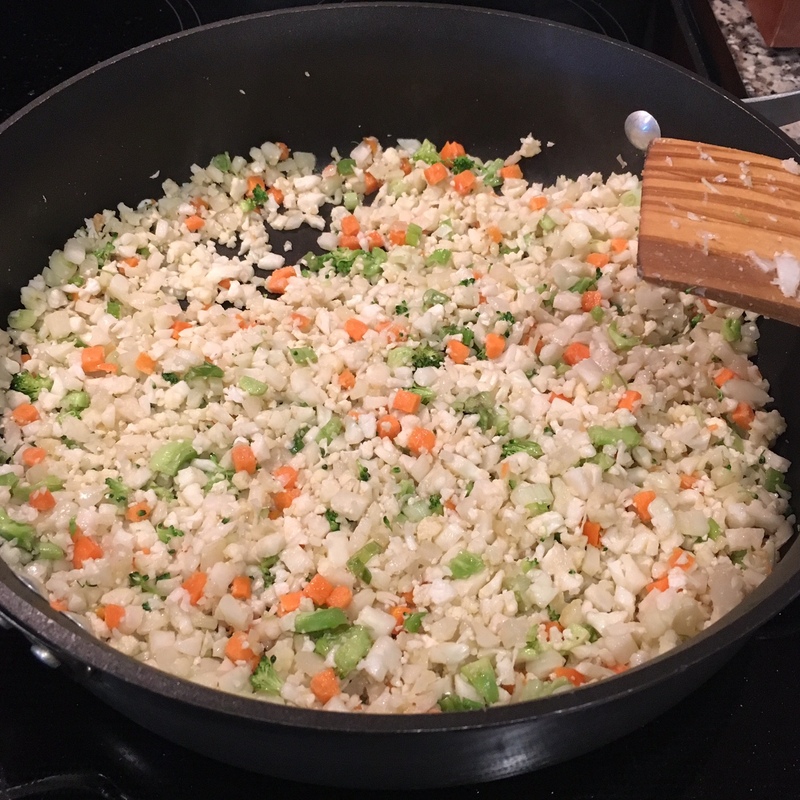 I've struggled to find a cauliflower rice recipe that I actually enjoy and finally realized that I was shredding the cauliflower into pieces that were too small. When I cooked them, they were mushy and gross. 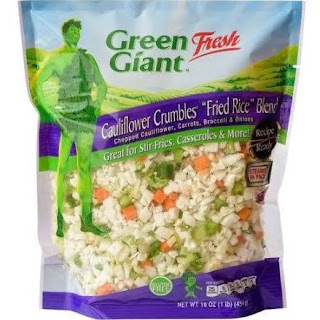 Then I found Green Giant Cauliflower Crumbles in the produce section at Wal-Mart and it was love at first sight. The "rice" is the right size and I don't have to do any prep work! For this recipe, I used the Green Giant Cauliflower Crumbles Fried Rice mix. Start by making the beef mixture and broth mixture. I like to buy stir-fry meat at the grocery store. 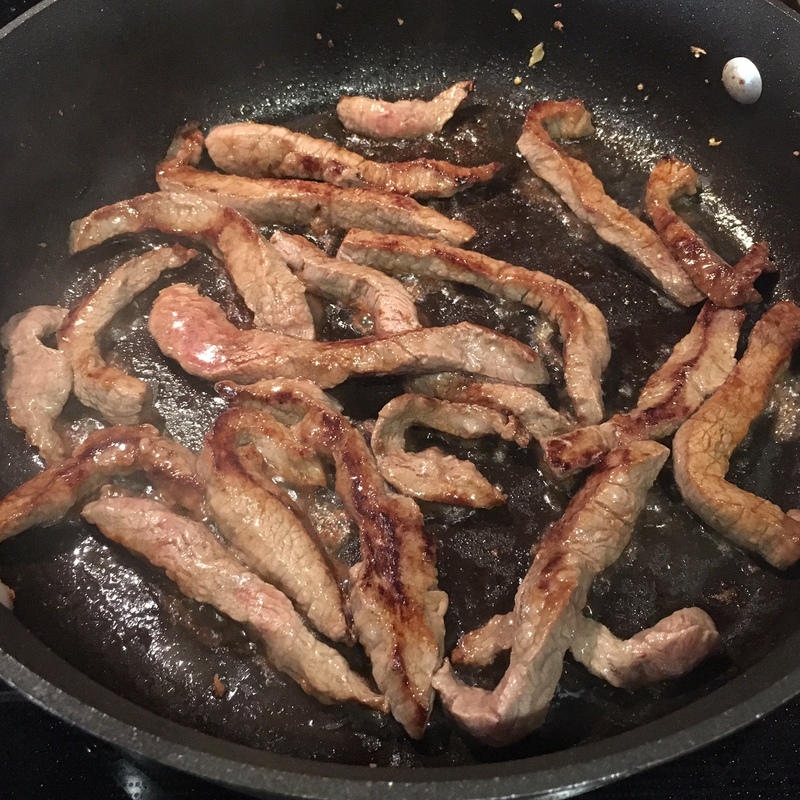 It's basically flank steak that has already been thinly sliced for you. Again, I'm all about less work in the kitchen! Place the meat in a mixing bowl and pour 1 tbsp of sherry and 1 tbsp of soy sauce over the meat. Stir together. Then make the sauce. I like to make this sauce in my glass one-cup liquid measuring cup (less dishes!). Stir together 1 tbsp sherry, 1 tbsp soy sauce (or coconut aminos if you're gluten free), beef broth, hoisin and Sriracha. Hold off on adding the cornstarch until later. Then make the fried rice. Heat a large saute pan to medium-high heat and add 1 tbsp olive oil. Dump in the whole bag of Fried Rice mix. Add 1/2 teaspoon of garlic powder. You can also chop two garlic cloves and add them if you don't want to do garlic powder. Saute the "fried rice" for about 7-8 minutes, or until the veggies have softened. Push the veggies to the side of the pan, making whole in the middle. Add in one egg, lightly whisked. 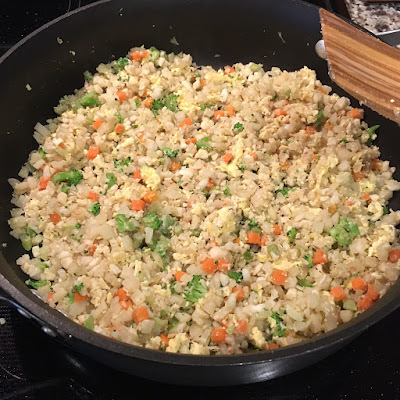 Scramble the egg once it begins to cook and then mix it into the "fried rice." Add in 1 tsp of toasted sesame oil and stir the mixture around to combine. Remove the fried rice from the pan to a separate bowl and cover to keep warm (or be like me and place in the microwave). Heat 1 tbsp of olive oil. Add in the beef mixture and brown the meat. Add the cornstarch to the broth mixture you made earlier and mix together to break up the cornstarch. Once the beef is browned, add the mixture to the pan. Heat until the mixture forms a luxurious brown sauce. Remove the pan before it overheats and gets too thick. To serve, spoon one cup of the fried rice mixture into a bowl and add the beef and the sauce. And enjoy! I can also attest that this heats up well! I had the leftovers for lunch on Monday! 1. Prepare the meat. 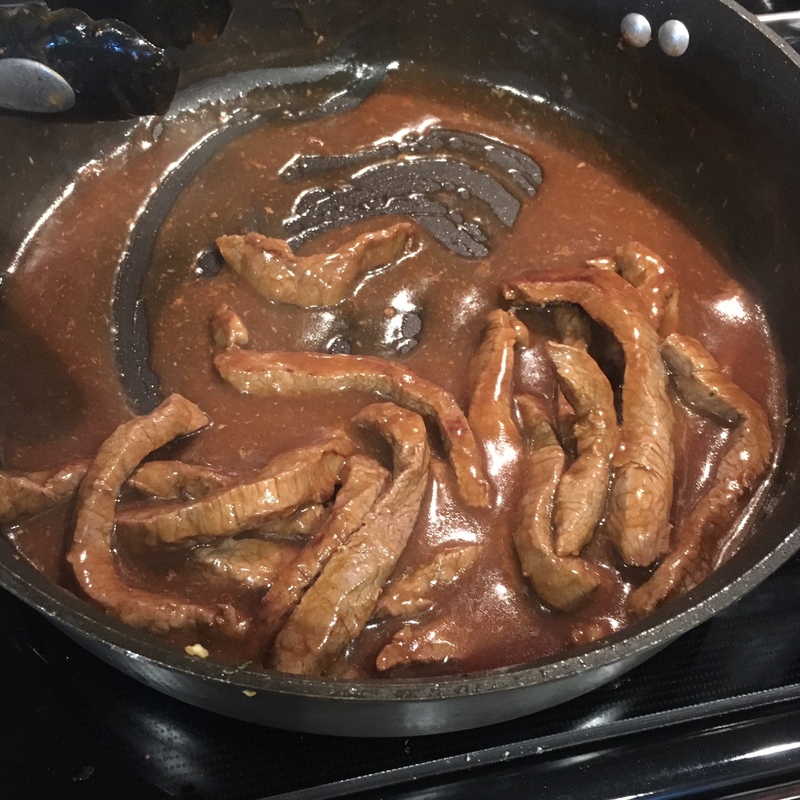 In a medium bowl, pour 1 tbsp sherry and 1 tbsp soy sauce over the meat. Set aside. 2. Prepare the saue. Mix together 1 tbsp sherry, 1 tbsp soy sauce, broth, hoisin and Sriracha. 3. Heat 1 tbsp olive oil in a large pan over medium-high heat. Dump the fried rice mix into the pan and saute for 7-8 minutes. 4. Push the fried rice to the edge of the pan, making a whole in the middle. Pour in the lightly whisked egg and scramble as it cooks. Mix in to the fried rice. 5. Add the garlic powder and toasted sesame oil and mix. Remove the fried rice from the pan into a separate bowl. Cover and set aside. 6. Heat the remaining tsbp olive oil. Brown the meat on all sides. 7. Mix the corn starch into the sauce and pour into the pan. Stir around until it thickens. Remove the meat and sauce from heat to prevent drying out. 8. To serve, place 1 cup of the fried rice in a bowl and top with meat and sauce. Enjoy! *this post was not sponsored by any of the brands mentioned, they are just the ones that I use! Looks delicious! I'm going to have to try mine this way for sure! Your kind of cooking sounds like my kind of cooking - quick and easy! this recipe sounds delicious; will definitely be making this recipe! This looks really good! Isn't it awesome when a kitchen experiment turns out so well?! This looks absolutely amazing! I've been looking for some healthy recipes to try. I've gotten a bit off track too, but this is great motivation! Oh yay!! I'm glad you tried it and loved it! It's my favorite way to eat broccoli in anything with a sauce! This may be my solution to one of my picky eaters' complaints. They hate eating things that are too big - these crumbles are perfection! I need to pick up a bag sooner rather than later.